You've decided to start training to walk a marathon, and your first step is to get the right shoes. They are your most essential gear, and you'll likely be spending many days and miles in them over the next few months. Your same old sneakers probably aren't the right choice. The day you make a commitment to training for the marathon, commit yourself to find good footwear. Save the minimalist shoes for shorter-distance workouts—they aren't appropriate for walking a marathon. For the long slow distance days in training and for the 26.2-mile marathon itself, you need shoes with adequate cushioning. Look at shoe ratings for the recommended distance for each shoe model and discuss it with your shoe dealer. Cushioning will reduce the leg and foot fatigue you feel during the event. Your marathon shoes also need to provide good support as your gait will get sloppy as you tire at long distances. Should You Wear Shoes or Boots? Marathon walkers in Europe often wear hiking boots for long distance walks. This may have evolved out of the military traditions of their longer walking events. For walking overland on trails, lightweight boots or trail shoes may be a good choice. But for road race marathons, a flexible running shoe with moderate support is the best choice for most people. Check the course of the marathon you plan to walk and see whether it will be mostly on streets and paved paths. You shouldn't need trail shoes or lightweight boots unless it is going to be on gravel or dirt paths. Because you probably won't be carrying a heavy pack on marathon day, you won't need heavy hiking boots. Your best bet is to find the local athletic shoe dealer that caters to serious runners and walkers. Tell the clerk about your marathon goals and mileage plans. They will check to see if you overpronate and need a motion control shoe or not. Then they will work to get you into a pair of shoes that are properly fitted. 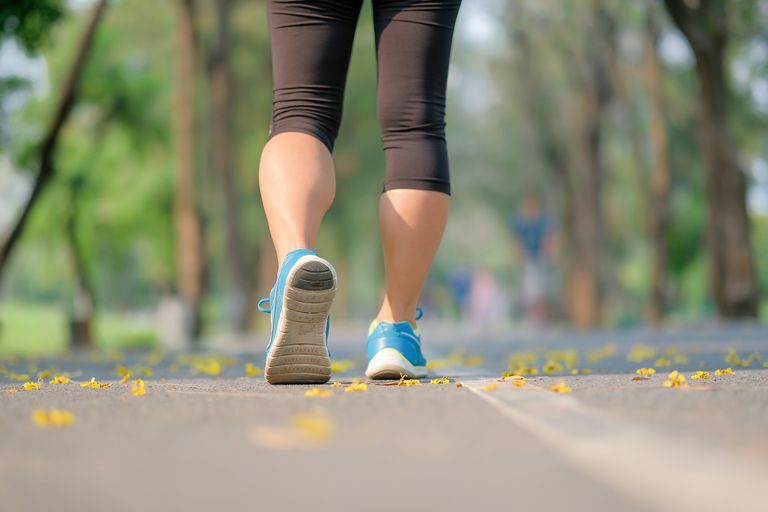 Remember that your feet will swell with distance walking, and you may need wider and bigger shoes for the marathon. These local stores rely on repeat customers and they will work to ensure you have the right shoes for an endurance race. Many serious runners and walkers recommend having two different pairs of shoes in which to train and trading them off each training day, never wearing the same shoes twice in a row. A day off also allows the shoes to fully air out between sessions. Some recommend training in two different models of shoes. The advantage to this is that the muscles and joints get variety in their workouts rather than falling into one pattern. Others don't think this is necessary. It's your choice. Most athletic shoes wear out after 300 to 500 miles. Expect that you will need to replace your marathon training shoes at least once during training. Once you find a model that works well for you, buy an extra pair or two so you can be sure to have a fresh model when the older pair begins to lose its cushioning and support. It is best to have a pair with only about 100 miles of wear on them for the marathon race itself. You want shoes that you have worn several times but that is still fully supportive and have full cushioning. The rule of "nothing new on race day" applies, especially to your shoes, as well as any insoles or orthotics you are used to using. If you are traveling by air to where the marathon is being held, don't trust your race shoes or race gear to the chance that checked luggage will be lost. Bring them on board in your carry-on luggage or wear them on the plane. Avoid wearing your marathon shoes the day before the marathon. You want them to be fresh for race day. If your race has a timing chip to attach to the shoe, attach it carefully the night before so you don't forget that important step. Now you are ready to lace them up on race day and go the distance. When Should You Return Your New Athletic Shoes?